An analysis of presidential debates clearly brings into sharper focus the adversarial function of political discourse. Its manifestations may be an efficient tool for studying the stylistic behaviour of each presidential contender individually and all presidential contenders collectively. The adversarial function is understood as a politician’s use of signs of explicit verbal aggression in order to fight rivals, bash them, and estrange himself or herself from their views. The study, besides singling out confrontation markers of the contenders, claims that the debates show negative trends in the language culture of modern politicians. The predominant relativism, which American English has long been known for, is being replaced by blatant straightforwardness affecting the choice of words, communicative strategies and tactics, and the well-known etiquette rules. This signals the emergence of a new generation of US politicians who will sure affect the local politics and geopolitical arena in the years to come. presidential debates, rhetoric, language culture, presidential contenders, adversarial function, political discourse, confrontation markers, emotives, invectives, affectives. Visson, L. (2003). Russian Issues in the English Speech. Words and Phrases in the Context of the Two Cultures. Moscow: R. Valent. (in Russ). Mukhortov, D. (2014). 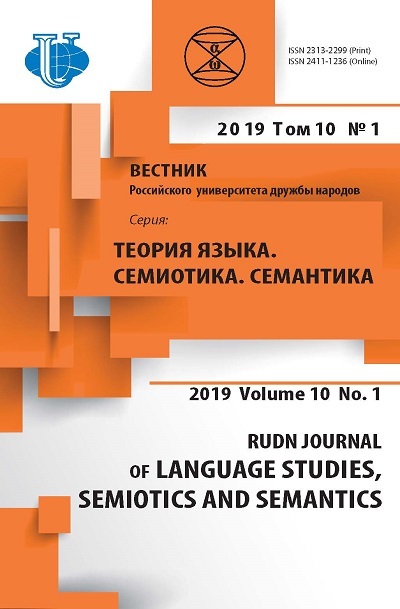 ‘Yazykovaya lichnost’, ‘rechevoy portret’, ‘idiostil’, ‘idiolect’: the notions of Russian scholars in contrast. What is required to study the stylistic behaviour of the politician? In Chudinov, A.P. (Ed. ), In: Political Communication: Prospects for the Development of the Scientific Direction: Materials of the Intern. Sci. Conf. ; 2014 26—28.08; Ekaterinburg. Ekaterinburg: Ural State Pedagogical University. p. 3—12. (in Russ). Sheigal, E.I. (2000). Semiotics of Political Discourse. [doctoral dissertation]. Volgograd. (in Russ). Buss, A. (1971). Aggression Pays. The Control of Aggression and Violence. NY, London. Pp. 18—35. Republican Candidates Debate in Houston, Texas. February 25, 2016. http://www.uspresidentialelectionnews.com/2016/02/full-video-cnn-republican-debate-from-houston/ (acсessed: 10.08.2016). Winter D.G., Hermann M.G., Weintbraub W. & Walker S.G. (1991). The Personalities of Bush and Gorbachev Measured at a Distance: Procedures, Portraits and Policy. Political Psychology, 3(12), 215—244, 457—464. Copyright (c) 2017 Mukhortov D.S.